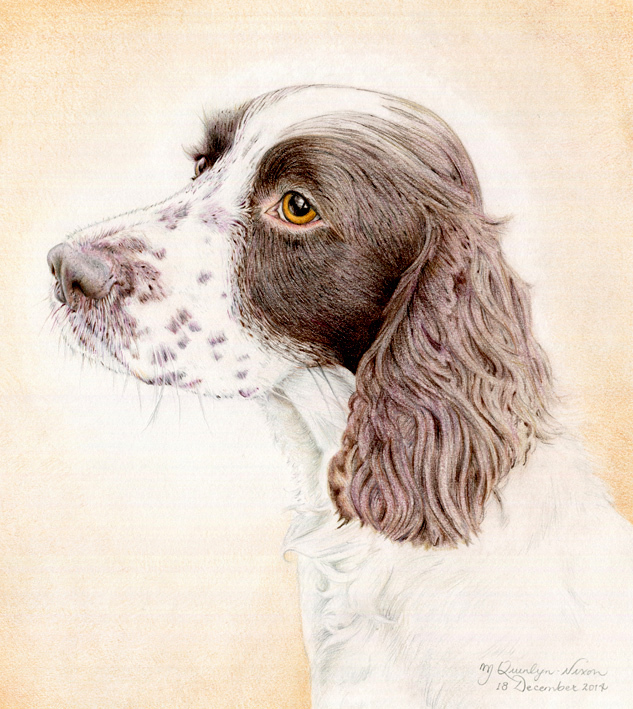 Of all of the breeds of dogs that I have drawn in my lifetime, spaniels must be the most frequent, followed close on the heels (or should I saw paws?) by Border Collies. A couple of weeks before Christmas I was contacted by a very friendly gentleman, named Keith, who asked me if I could draw his daughter’s fiance’s dog. Within a few days I was being collected by Keith and taken to his home to photograph the dog, who turned out to be a highly intelligent and very active Springer Spaniel, by the name of Alfie. I love it when people arrange to have special and totally unique illustrations done for friends and relatives. There is usually so much thought behind these actions and it always speak volumes of how highly regarded the recipients are to those that commission the illustration. It’s always lovely to draw people’s pets, but when you have met the pet and made their acquaintance it does make the illustration all the more special for me. Alfie had a lot of white fur, which was complemented by his dark chocolate fur and the amber tone of his eyes. He is a very handsome dog indeed and one that would be a lovely companion to a dog lover. The illustration took a few days to complete and because of the large area of white on Alfie’s chest, I put in a suffused raw sienna tone behind him, to highlight the profile of his fur. The commission was done in secret and collected by Keith, who was very pleased with the result… I heard later, that the illustration had been a big hit with the young gentleman, Marc, who had received the illustration on Christmas Day.